Objective The aim was to evaluate and compare the analgesic efficacy of tramadol versus hyoscine-N-butylbromide intramuscularly given during the active phase of the first stage of labor. Materials and methods This prospective study included 140, American Society of Anesthesiologists I, laboring primigravidae, who were divided into two equal groups: group I (group B) received hyoscine-N-butylbromide (Buscopan) 40 mg intramuscular and group II (group T) received tramadol 100 mg intramuscular. Labor pain was assessed by visual analog scale before and at 30 min, 1 h, 2 h, and 3 h after drug administration. Maternal and neonatal adverse effects, drug-delivery interval, mode of delivery, need for additional analgesia, and postpartum maternal satisfaction were assessed too. Results Baseline visual analog scale scores were comparable between the groups (P>0.05). Pain scores at 30 min, 1 h, 2 h, and 3 h were significantly higher (P<0.001) in group B. 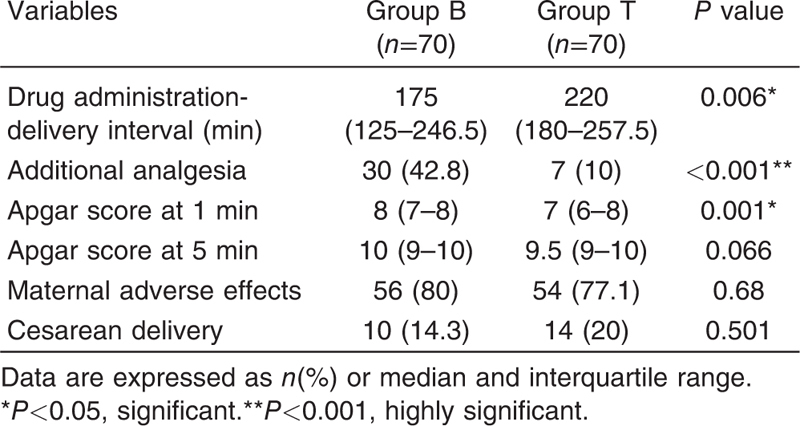 Overall, 30 (42.8%) women in group B required additional analgesia versus only seven (10%) women in group T (P<0.001). Drug-delivery interval was significantly (P<0.05) shorter in group B at 175 versus 220 min in group T. Apgar score at 1 min was significantly higher (P<0.05) in group B, whereas the scores at 5 min were comparable (P>0.05). A total of 56 (80%) women in group B had adverse effects versus 54 (77.1%) women in group T (P>0.05). Adverse effects were generally mild (well tolerated). Cesarean delivery percentages were comparable between the groups (P>0.05). Postpartum maternal satisfaction was significantly higher (P<0.001) in group T.
Conclusion Although Buscopan is cheap and safe, it is a less effective intrapartum analgesic than tramadol. It offers shorter duration of labor, so it is better recommended for primiparous women. Tramadol is a synthetic analog of codeine. It is a weak opioid agonist that acts centrally by modification of transmission of pain impulse by alteration of monoamine reuptake mechanisms . It can be administered by many routes: orally, rectally, intravenously, or intramuscularly. It is principally metabolized in the liver, and 90% of metabolites are excreted in urine . Main adverse effects of tramadol are on central nervous system (dizziness, drowsiness, fatigue, headache, and sedation) gastrointestinal system (nausea, vomiting, dryness of mouth, and constipation), cardiovascular system (orthostatic dysregulation and tachycardia), and respiratory system (respiratory depression). High doses have central and respiratory depressant effects and may be antagonized by naloxone. Tramadol crosses the placenta, and its concentration in the umbilical venous serum reaches ∼80% of maternal level . Although it is a potent narcotic-like drug, there are less incidence of neonatal respiratory depression  and lack of gastrointestinal adverse effects  in neonates compared with classic narcotic analgesics. Hyoscine-N-butylbromide (HBB) is a derivative of hyoscine which is extracted from leaves of the Duboisia tree found mainly in Australia . HBB is one of the anticholinergic spasmolytic drugs. It has been used to shorten the duration of labor in many hospitals elsewhere in the world . HBB inhibits cholinergic transmission in the abdominal and pelvic parasympathetic ganglia, thus relieves spasm in the smooth muscles of the gastrointestinal, biliary, urinary, and female genital organs, especially the cervicouterine plexus and thus aids cervical dilatation . HBB has no central action, as it does not cross the blood–brain barrier . Main maternal adverse effects of HBB include dry mouth, facial flushing, dryness of the skin, photophobia, loss of concentration, urinary retention, and constipation, and in neonates, it may produce tachycardia . The aim of this study was assessment of the analgesic efficacy of tramadol intramuscular (IM) and HBB (Buscopan) IM in laboring women during the first stage of labor and its correlation with the duration of labor and early postpartum maternal satisfaction, and to document safety of both drugs by recording their adverse effects, either maternal or neonatal. This randomized double-blinded controlled study was conducted at the labor ward of Ain Shams University Maternity Hospital after being approved by the ethical committee. The patients and investigator were blind throughout the study period (neither the patient nor the investigator knew if the drug taken is HBB or tramadol). The study included 140 primigravidae admitted for delivery and seeking analgesia during labor after obtaining an informed written signed consent from each woman, taking detailed medical and surgical history, and undergoing clinical examination. Women were selected in the study according to the following inclusion criteria: age (18–35 years), primigravidae, American Society of Anesthesiologists I, uncomplicated term singleton pregnancy (37–42 weeks of gestation), active labor, cervical dilatation (3–6 cm), spontaneous onset of labor, and viable and average weight fetus with vertex presentation. Exclusion criteria included extremes of age (<18 years or >35 years), any medical disorder during pregnancy, use of any other kind of analgesia before recruitment in the study, previous history of hypersensitivity to either drug, induction of labor, multiparity, multiple gestation, malposition, malpresentation, cervical dilation less than 3 cm or greater than 6 cm, obstetric complications such as pre-eclampsia, antepartum hemorrhage, fetal distress, known fetal abnormality, oligohydramnios, or polyhydramnios. Included women were randomly divided into two equal groups (70 patients each): group I (group B) received HBB (Buscopan 20 mg, 1 ml ampoule, manufactured by Boehringer Ingelheim Co., Ingelheim am Rhein, Germany) at a dose of 40 mg IM, and group II (group T) received tramadol (Mabron 100 mg, 2 ml ampoule, manufactured by Medochemie Ltd., Limassol, Cyprus) at a dose of 100 mg IM, at the active phase of first stage of labor. Pain was assessed (reported by participants; assessment was performed by one person who had no role in patient enrollment and was blind to the drug administration) according to the 100 mm visual analog scale (VAS); a 100 mm horizontal line bounded by ‘no pain’ and ‘the worst pain’, immediately before receiving the study drug, and at 30 min, 1 h, 2 h, and 3 h after drug administration. Assessment was done immediately after release of uterine contraction and not during it. The analysis of VAS for pain measurement suggested that VAS of 0–4 mm was equivalent to ‘no pain’, 5–44 mm ‘mild pain’, 45–74 mm ‘moderate pain’, and greater than 75 mm was considered ‘severe pain’ . Participants were observed for the requirement of further analgesia; meperidine in a dose of 1 mg/kg intravenously was given on demand (patient request). The following were recorded: the drug administration-delivery interval, mode of delivery, maternal adverse effects of both drugs, neonatal outcome including Apgar score as well as early postpartum maternal satisfaction, which was determined at the maximum analgesic effect after drug administration according to VAS score as follows: VAS score of 10–30 signifies very good satisfaction, VAS score of 31–50 signifies good satisfaction, VAS score of 51–70 signifies fair satisfaction, and VAS score of 71–100 signifies worse satisfaction . Randomization was achieved with computer-generated random sequence using MS Excel (ME Excel 2007; by Microsoft Corporation in Redmond, Washington, USA). Allocation concealment was done using consecutively numbered opaque sealed envelopes kept by the hospital pharmacist. Both caregiver and participants were blinded to the group allocation. Sample size was calculated using Stata version 11 programme (StataCorp., College Station, Texas, USA), setting the type-1 error (α) at 0.05 and the power (1β) at 0.8. Results from a previous study by Aggarwal et al. showed that the mean percentage change in pain scores from baseline (i.e. pain relief) in the HBB (Buscopan) group was 35.6% whereas for the tramadol group, pain relief is expected to be 60% from baseline. Calculation according to these values produced a minimal sample size of 70 women for each study group. Statistical analysis was done on a personal computer using IBM SPSS statistics version 21 (IBM Corp., Armonk, New York, USA). The Shapiro–Wilk test was used to examine the normality of numerical data distribution. Skewed numerical data were presented as median and interquartile range. The Mann–Whitney U-test was used for intergroup comparisons. Categorical data were presented as number and percentage, and between-group differences were compared using the Pearson’s χ2-test or the χ2-test for trends for nominal or ordinal data, respectively. All P values are two-sided. P value of less than 0.05 was considered statistically significant. Both groups were comparable (P>0.05) regarding age, weight, height, gestational age at delivery, and cervical dilatation at time of drug administration ([Table 1]). There was statistically nonsignificant difference (P>0.05) between the two groups in baseline (initial) pain scores. Pain scores at 30 min, 1 h, 2 h, and 3 h after drug administration were significantly higher in group B (P<0.001) ([Table 2]). There was a statistically significant decrease (P<0.05) in the median drug administration-delivery interval; duration of labor was shorter in group B than group T, 175 versus 220 min, respectively. However, 30 (42.8%) women of group B required additional analgesia, whereas only seven (10%) women of group T required it (P<0.001), reflecting the higher analgesic efficacy of tramadol ([Table 3]). Neonatal Apgar score at 1 min was significantly higher (P<0.05) in group B, whereas the scores at 5 min were comparable (P>0.05) between the two groups ([Table 3]). There was no significant difference (P>0.05) in the incidence of maternal adverse effects in both groups: 56 (80%) women in group B versus 54 (77.1%) women in group T ([Table 3]). The incidence of cesarean delivery was comparable (P>0.05) in both groups: 10 (14.3%) women in group B versus 14 (20%) women in group T ([Table 3]). 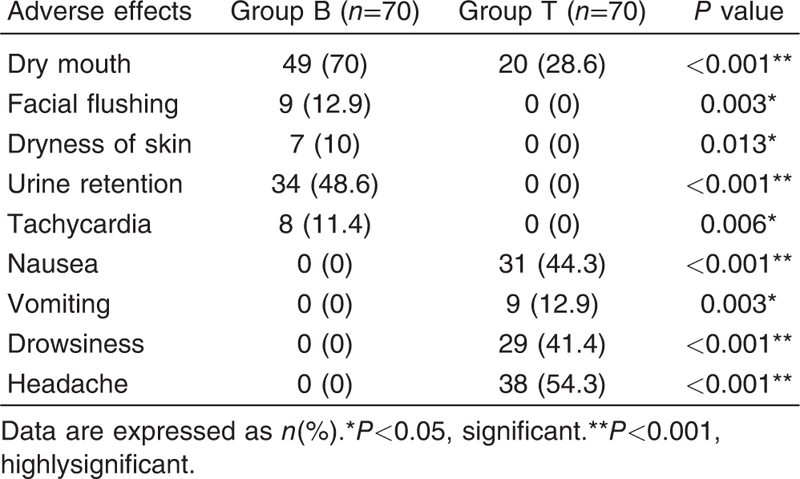 Regarding adverse effects of both drugs, dry mouth, urine retention, facial flushing, dryness of skin, and tachycardia were significantly higher (P<0.05) in group B, whereas nausea, vomiting, drowsiness, and headache were significantly higher (P<0.05) in group T ([Table 4]). There was significantly (P<0.001) higher analgesic maternal satisfaction scoring in group T; 53 (75.7%) women in group T had very good satisfaction versus only two (2.9%) women in group B with the same score. No women in group T showed fair or bad satisfaction, whereas 30 (42.8%) women and seven (10%) women in group B had fair and worse satisfaction, respectively ([Table 5]). Many options for pain relief during labor exist, both pharmacological and nonpharmacological, from which the parturient can choose. Antenatal care should include education of women regarding all methods of analgesia during labor available in such a particular unit . The ideal obstetric analgesic should provide potent analgesic efficacy with minimal maternal and neonatal adverse effects. Although epidural analgesia provides the best analgesia during labor, its high price is disadvantageous for many women. Administration of injectable drugs such as tramadol or Buscopan represents a less invasive, simple, and cheap alternative . In this study, tramadol showed a significant pain relief effect (P<0.001) in comparison with Buscopan at all subsequent assessments, at 30 min, 1 h, 2 h, and 3 h after administration. The requirement of additional analgesia was significantly higher (P<0.001) in group B compared with group T, with 30 women versus only seven women. In many studies, the analgesic efficacy of tramadol had been compared with that of meperidine, with variable results. Husslein et al. found similarity in the analgesic effects of 100 mg tramadol and 100 mg pethidine; an analgesic effect was observed in both the pethidine and the tramadol groups by both the pregnant women and the attending physician about 10 min after administration lasting for ∼2 h, and slightly shorter duration of labor in the pethidine group; the difference was statistically insignificant (P>0.05). However, Keskin et al. reported that in the same doses, 100 mg IM, pethidine seems to be a better alternative than tramadol in obstetric analgesia because of its superiority in analgesic efficacy and low incidence of maternal adverse effects. Viegas et al. concluded that tramadol 100 mg IM is as effective as pethidine 75 mg IM but has a superior safety profile, with similar results obtained thereafter by Fieni et al. . However, Khooshideh and Shahriari  reported that administration of 100 mg IM tramadol had an analgesic effect close to that of 50 mg IM pethidine; both provided comparable moderate analgesia in the first stage of labor, and they found the duration of labor was shorter in tramadol group than pethidine group for the first stage of labor (P<0.0001) and also for the second stage (P=0.001). Elbourne and Wiseman  searched the Cochrane Pregnancy and Childbirth Group trials register and included 16 randomized trials in their review. The objective of their review was to assess the effects of different opioids administered intramuscularly in labor. They found that there was no evidence of a difference between pethidine and tramadol in terms of pain relief or interval to delivery. The role of HBB as a labor analgesic was studied by Aggarwal et al. who reported pain relief of up to 75% in some patients of the test (Buscopan) group, although the mean pain relief in this group was ∼36% compared with only 12.5% pain relief in the control group (P<0.001). This can be explained by the presence of mediators other than parasympathomimetics which may be involved in the pain pathways from the pelvic structures in general and cervical dilatation in particular. In addition, a part of the pain relief afforded by HBB may be owing to shortening of the duration of labor, thus making it less tiring. In this study, the median drug administration-delivery interval was significantly shorter (P<0.05) with Buscopan use (175 min) as compared with tramadol use (220 min), denoting shorter duration of labor with Buscopan despite the better analgesic effect of tramadol. Reducing the duration of the first stage of labor has potential benefits including the lower incidence of complications associated with prolonged labor, for example, neonatal sepsis or maternal infection such as chorioamnionitis or puerperal sepsis, and it would be welcomed by women and by health authorities whenever limited medical resources exist in developing countries . So, HBB would be advantageous as a single intrapartum analgesic with shortening of labor duration as compared with tramadol. Coinciding with the result of this study, the use of HBB has been reported by many to be associated with shortening of the mean length of the first stage of labor by 1.2 h compared with the control group (a decrease of 31.7%) (P=0.001) in Samuels et al. study and by 4.5 h compared with the control group (P <0.001) in the study by Aggarwal et al. . Al-Qahtani and Al-Hajeri  found a statistically significant shortening in the duration of first stage of labor in the HBB group by 50 min (a decrease of 23.3%) compared with the control group (165 vs. 215 min, respectively) (P=0.001), with no significant changes in the duration of second (P=0.063) or third stages (P=0.0418) of labor. Sirohiwal et al. found a significant decrease in the duration of first stage of labor in the HBB group compared with the control group (123.86±68.89 vs. 368.05±133 min, respectively), whereas there were no significant differences in the duration of the second and third stages of labor, but they preferred to avoid the rectal route because it is inconvenient to laboring women in pain. Makvandi et al. studied the rate of cervical dilatation, and it was 2.6 cm/h in the HBB group versus 1.5 cm/h in the control group (P<0.001); the active phase of the first stage and second stage was significantly shorter in HBB group (P=0.001 and <0.001, respectively). Both tramadol and Buscopan were safe for both mother and fetus. In this study, maternal adverse effects were found in 54 (77.1%) women in group T, whereas 56 (80%) women showed adverse effects in group B; with statistically nonsignificant difference (P>0.05). Dry mouth, facial flushing, dryness of skin, retention of urine, and tachycardia were significantly present (P<0.05) in group B, whereas nausea, vomiting, drowsiness, and headache were significantly present (P<0.05) in group T. In both groups, all adverse effects were generally mild and well tolerated, and no treatment was given, except for cases of group T with vomiting who were treated with metoclopramide 10 mg intravenously. The median 1 min Apgar score was significantly lower in group T than that of the group B (P=0.001). However, there was no significant difference between both groups at 5 min (P>0.05), denoting safety of both drugs on neonatal outcomes in the present study. The results of this study coincide with Al-Qahtani and Al-Hajeri  who found no significant difference in Apgar score after intramuscular 40 mg HBB compared with placebo. This is also supported by findings by Makvandi et al. ; there were no significant differences in Apgar scores at 1 and 5 min after delivery in both Buscopan and control groups. In this study, maternal satisfaction was significantly higher (P<0.001) in group T; most patients (53 women; 75.7%) of this group had very good satisfaction, whereas no patients of the same group showed fair or bad satisfaction. This clearly reflected the more analgesic efficacy (potency) of tramadol compared with Buscopan. The limitation of this study is that a subjective component like pain was assessed; which is not always accurate, as many factors affect its assessment, including personal pain threshold, pre-existing psychological problems, sociodemographics, and the kind of support provided during labor. Both Buscopan and tramadol are effective intrapartum analgesics without any obvious adverse outcomes either maternal or neonatal. Buscopan is cheap and safe, although it is a less effective intrapartum analgesic than tramadol. It offers shorter duration of labor, so it can be used in labor pain management of parturients in general and primiparous women in particular. Khooshideh M, Shahriari A. A comparison of tramadol and pethidine analgesia on the duration of labour: a randomised clinical trial. Aust N Z J Obstet Gynaecol 2009; 49:59–63. Lee CR, McTavish D, Sorkin EM. Tramadol: a preliminary review of its pharmacodynamic and pharmacokinetic properties, and therapeutic potential in acute and chronic pain states. Drugs 1993; 46:313–340. Husslein P, Kubista E, Egarter C. Obstetrical analgesia with tramadol − results of a prospective randomized comparative study with pethidine. Z Geburtshilfe Perinatol 1987; 191:234–237. Shamim F, Hoda MQ, Samad K, Sabir S. Comparison between tramadol and pethidine in patient controlled intravenous analgesia. J Pak Med Assoc 2006; 56:433–436. Tytgat GN. Hyoscine butylbromide: a review of its use in the treatment of abdominal cramping and pain. Drugs 2007; 67:1343–1357. Samuels LA, Christie L, Roberts-Gittens B, Fletcher H, Frederick J. The effect of hyoscine butylbromide on the first stage of labour in term pregnancies. BJOG 2007; 114:1542–1546. Hotwani J, Ainapure SS. Hyoscine butylbromide suppositories. Indian Medical Gaz 2000; 217–219. Baracho HM, Kamat JR, Kunalhekar JI. Buscopan in acceleration of labor. J Obstet Gynecol Ind 1984; 34:509–512. Davenport K, Timoney AG, Keeley FX. Conventional and alternative methods for providing analgesia in renal colic. BJU Int 2005; 95:297–300. Jensen MP, Chen C, Brugger AM. Interpretation of visual analog scale ratings and change scores: a reanalysis of two clinical trials of postoperative pain. J Pain 2003; 4:407–414. Morgan PJ, Halpern S, Lam-McCulloch J. Comparison of maternal satisfaction between epidural and spinal anesthesia for elective cesarean section. Can J Anaesth 2000; 47:956–961. Aggarwal P, Zutshi V, Batra S. Role of hyoscine N-butyl bromide (HBB, buscopan) as labor analgesic. Indian J Med Sci 2008; 62:179–184. Enkin MW, Keirse MJ, Renfrew MJ, Neilson JP. Effective care in pregnancy and childbirth: a synopsis. Birth 1995; 22:101–110. Keskin HL, Keskin EA, Avsar AF, Tabuk M, Caglar GS. Pethidine versus tramadol for pain relief during labor. Int J Gynaecol Obstet 2003; 82:11–16. Viegas OA, Khaw B, Ratnam SS. Tramadol in labour pain in primiparous patients. A prospective comparative clinical trial. Eur J Obstet Gynecol Reprod Biol 1993; 49:131–135. Fieni S, Angeri F, Kaihura CT, Ricci L, Bedocchi L, Galanti B et al. Evaluation of the peripartum effects of 2 analgesics: meperidine and tramadol used in labor [article in Italian]. Acta Biomed Ateneo Parmense 2000; 71(Suppl 1):397–400. Elbourne D, Wiseman RA. Types of intra-muscular opioids for maternal pain relief in labour. Cochrane Database Syst Rev 2006; 3:CD001237. Al-Qahtani NH, Al-Hajeri F. The effect of hyoscine butylbromide in shortening the first stage of labor: a double blind, randomized, controlled clinical trial. Ther Clin Risk Manag 2011; 7:495–500. Sirohiwal D, Dahiya K, De M. Efficacy of hyoscine-N-butyl bromide (Buscopan) suppositories as a cervical spasmolytic agent in labour. Aust N Z J Obstet Gynaecol 2005; 45:128–129. Makvandi S, Tadayon M, Abbaspour M. Effect of hyoscine-N-butyl bromide rectal suppository on labor progress in primigravid women: a randomized double-blind placebo-controlled clinical trial. Croat Med J 2011; 52:159–163.